The beautiful Fox Creek Golf Course was designed by Gary Kern and Associates, Golf Course Architects. While mainly active in the Midwest, Kern has designed golf courses from Massachusetts to Oklahoma. The firm’s slogan: “Contemporary Design in the Classic Style,” describes their design philosophy. The ultimate goal in design of a golf course is for every level of player to find the course enjoyable. The weekend Fox Creek golfer will feel challenged. Every golfer will want to return to this beautifully wooded 18 hole course that winds between seven lakes. 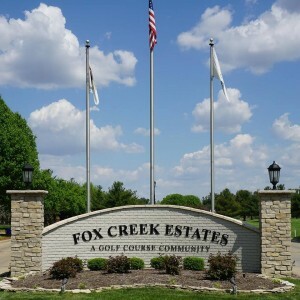 Fox Creek Golf Course is a semi-private 18 hole course which offers all levels of golfers a real challenge to their playing skills. Rolling terrain, wooded bluffs, winding creeks and seven lakes make this course scenically beautiful as well as challenging. Paved golf cart paths carry golfers between the newly replaced Latitude 36 fairways. Latitude 36 is a state of the art bermuda/zoysia hybrid grass. This particular strain of grass is perfect for Fox Creek. Golfers need to come out and experience what this newly developed grass can bring to both a golf course and the golfers experience.